This article continues from last quarter with preparing for your meeting with an attorney and selecting the best attorney for you. Our focus is choosing the best fit for you — not the best fit for your sister/brother, cousin, or neighbor. What follows are my top five tips on how to evaluate a potential attorney, to find the person who is going to not only represent you in the best light but also make you feel at ease. do you want an attorney who is going to argue at every step of the way or do you want an attorney who takes a more collaborative approach? There’s nothing wrong with either of these approaches. Remember it’s all about your comfort level with the person. There are some attorneys out there who make their own clients cry and other attorneys who bend over backwards to make them feel comfortable and at ease. do you want to be hands on every step of the way or do you want to just be told the bottom line? 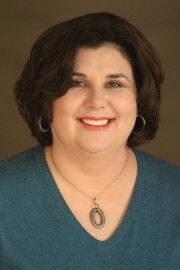 Each step of most family law cases involves communications back and forth between counsel, possibly the court, etc. Do you want to have the final say on everything that goes out of your lawyer’s office or do you just want them to handle all the details and you get the final approval for the end result? do you want an attorney who strictly follows procedure or one that thinks outside of the box? In law, very specific things must happen at very specific times. At the same time though, the law is an ever-changing field. Do you want someone who can see beyond the black and white of the law and find creative solutions to problems? what does your gut tell you? Your gut and intuition are strong indicators about other people and situations. When you walk into that attorney’s office do you feel good or bad? Do you feel safe or unsafe? Is the attorney’s staff welcoming or are you treated as just another appointment on their calendar? These basic questions and resulting feelings tell you a huge amount of information and you should listen! what types of services are offered? How much do they cost? Obviously these points are a huge factor when picking an attorney. What is your budget for obtaining legal help? Do you have enough money for her or him to handle your case from start to finish (sometimes thousands, tens of thousands and sometimes hundreds of thousands) or do you have a set amount that you can afford? Does the attorney offer other types of representation besides the traditional model of full representation? What about fixed fee services? Will the attorney work with you to establish a payment plan or does the entire amount need to be paid up front? Do you want to handle the case largely by yourself or does the thought of stepping into the courthouse send you into panic? Now I’d like to move to a more personal topic – setting expectations for you, the client. We attorneys are not miracle workers. We can only work with the facts of your case that have already happened through your own choices and actions. If you have a history of not being involved in your child’s life and come to my office wanting sole custody of that child, it’s not going to happen. If you’ve been the unintended breadwinner in your marriage while your spouse hasn’t been able to hold a job, you’re probably not going to be looking at a 50/50 split. We attorneys are professional colleagues and frequent the same professional associations, meetings, Continuing Legal Education seminars and might even be neighbors. We will most likely talk to each other in courteous ways when in your presence at mediations, settlement negotiations, etc. This does NOT mean that we scheme behind closed doors to your disadvantage. We are still representing our own client’s interest and only those interests and doing the best we can do to preserve your rights. 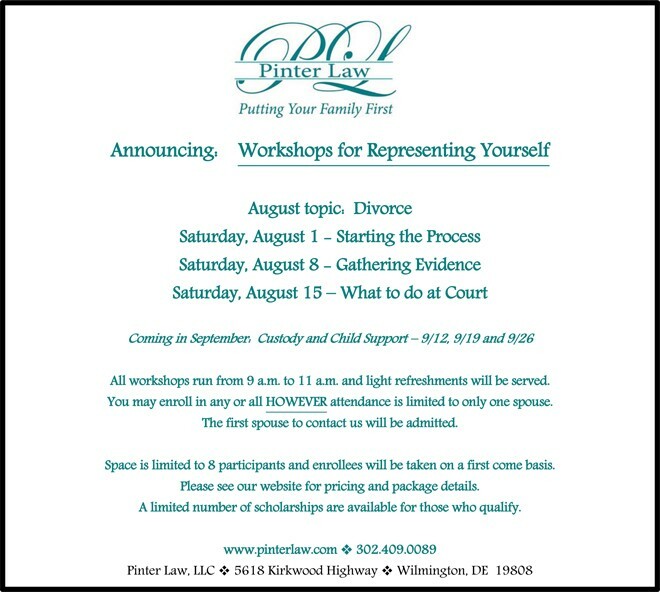 Lastly, Pinter Law, LLC, is excited to begin offering workshops during which attendees will learn the nuts and bolts of representing yourself in Family Court and actual legal advice. The first workshop in August is about divorce. Please see our ad below for details. We hope to see you there!